When you hear “chia,” you may think of “Chia Pets.” These are clay figures sold in the US that support the growth of chia sprouts. But chia has a much longer history as a medicinal herb. It originated in Mexico and was cultivated by the Aztecs. Supposedly, the Aztecs, Mayans, and Incans used chia as a staple of their diet and as an energy food. Chia means “strength” in the Mayan language, and they were known as the “Indian Running Food” because runners and warriors would use them for sustenance while running long distances or during battle. The chia seeds are “super” because, like a superfruit, they deliver the maximum amount of nutrients with minimum calories. They have several of the same benefits as the more well-known “super seed” flax, but unlike flax seed, you don’t need to grind them to reap the health benefits. 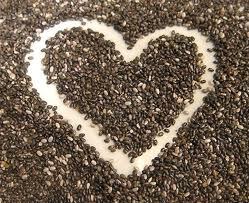 The nutritional benefits of chia include fiber, omega fatty acids, calcium, antioxidants and much more – even protein! Not only are chia seeds gluten and grain free naturally, but one tablespoon of this SUPER SEED has more calcium than a glass of milk, more Omega-3s than Salmon and more antioxidants than blueberries. Who Knew? Lord knows I didn’t! Anywho, Chia seeds are super high in soluble fiber which, in addition to filling you up, has cholesterol-lowering properties and prevents the absorption of fat. GIVE ME SOME NOW!!!! LOL Whether it be for breakfast, lunch, dinner or a simple mid-day snack, chia seeds are very easy to incorporate into your everyday diet. Try eating them raw. Or Try stirring two tablespoons of “whole” or “raw” chia seeds into a glass of water or fruit juice. Wait a few minutes, drinking them down before the seeds absorb the liquid and get hard. They are also perfect in oatmeal and puddings and they make an ideal addition to baked goods including breads, cakes and biscuits. So go ahead and try a healthy “Cha-Cha-Cha-Chia” recipe today. It will help you curb those mid-day cravings!